With the summer setting in, everyone is flocking to their summer trips - but for the millionaire traveler, they want something a little different. It's the perfect time for a romantic getaway or to find a summer romance, but the millionaire traveler needs to be sure that luxury is guaranteed every step of the way. Luckily, there are so many astounding resorts out there that guarantee 5-star service, for those who are in the know. And our friends from Millionaire Match shares their top destination. If it's time for a little adventure, this luxurious option can give a millionaire unmatchable views of the savannah and all of the animals that live there - or they take a private hot air balloon ride and see it from above. Book now here. Forty miles off of the coast of Antigua, Jumby Bay Island can only be reached by boat - but it's worth the journey. Absolutely gorgeous in its own right, one can enjoy pristine pools and four-miles of beach. With a kids' club, this is the perfect option for the millionaire family. If it's time for something a little different, this river lodge - which also includes an 82-foot pool, is an innovative option. Explore the 123,500 acres or just stay home and enjoy having every need met in style. Top celebrities flee to Lake Como in the summer - and for very good reason. In the middle of Italy, the food is in incomparable, and the Grand Hotel will give the millionaire a truly upscale experience. Book now here. This private island lets visitors indulge in every luxury in total seclusion. Cambodia's first luxury private island resort, they want their guests to have a totally unique experience, whether that's lounging by the infinity pool or exploring the unusual marine life in the perfectly clear waters. Book now here. It has been such a privilege to stay here. The spirit of this place is one of natural healing and love. It is so mindfully and beautifully sustained. Everyone has been lovely. This "sanctuary for the senses" is ideal if someone is looking to truly unwind. The spas, the massage, the relaxation - they'll leave here feeling like a totally new person. Book now here. Consistently voted the best resort in the US, this resort takes the traditional ranch idea and drenches it in luxury. Set on 30,000 acres amid the Sierra Madre, it's a great option for a millionaire who has tried all of the top beach resorts and wants something a little more adventurous. Private island or stunning ranching, there's an adventure out there for everyone. And, for those in the know, they can do it in style. Clear your schedule now and pack your bags! For more luxury travel selection, you may also check our list at Agoda. Looks so luxurious but I can only dream of being to these resorts! Top on my list is the chocolate resort in St. Lucia. What about yours? 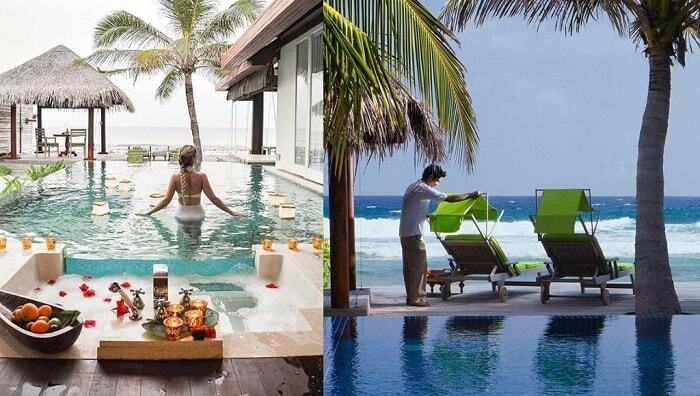 I wish to experience that Maldives luxury! These luxury resorts are really worth visiting and as they have all luxuries in lap of nature. I would love to check out Matetsi River Lodge at Zimbabwe as it looks really exotic place. Thanks for sharing! That's cool! Report on us when you did, and enjoy every moment. Each of these resorts is so enticing! But somehow, whenever we go travelling, we end up being on the move all day long, and hardly spend any time in the resort :) We really need a trip where we can just laze around in a beautiful place like one of these. Travelling luxuriously is every girls dream. But I totally agree with Punita. Whenever we go out somewhere, while booking the hotels, we think that we only have to sleep here in night and end up searching for deals. Hope to get to one of these resorts one day. Fingers crossed. Me too! If the whole resort have this amenities, who would choose to go out the hotel?! I agree. We need to add a millionaire friend in our list! Well, I live in Finalnd ,and I have the same amount of privacy hahaha. Not sure I would be a celebrity to stay in one of those though. OMG you are a lucky lad! That's quite a thorough list! Now where should I go next? I would probably pick the Brush Creek ranch. I love mountainous landscapes. Yeah and maybe you'll meet your next business partner! The list of ten luxury resorts looks fantastic. I would live to go Maldives and try those island resort with private beaches and private butlers. Maldives for me as well! Thank you Anna for visiting! Hahaha let's go and fly there! The hotels and its view are simply spectacular. Can only dream of living there. But Maldives and Kenya is my top travel bucket-list, but have to look for other resorts. I know right?! I want too! I want to jet to all of these places! I’m not a millionaire but I love looking at lists like these! I would love to go to the Maldives but I need to figure out an affordable way to do it. I wouldn’t mind enjoying some of these perks like the massage in Cambodia or enjoying chocolate everything in St. Lucia! We need to add a millionaire-friend into our list of- go-to. I am teasing my boyfriend for these destination!